Tradition, Technology, Together… Living It! Again and again, island by island, the KIALOA spirit bumps into us as we travel. Ed and I are 42 years into our marriage but a solid 48 into the life we love together. From the early days we were in, on and around the ocean (Atlantic in S. Florida) and Hawaii dreaming from the beginning. We both wonder at what twists and turns our lives would have taken if we turned our back on the scholarship/college route that was the “right” choice and instead, headed off to Hawaii like Meg Chun did. If you don’t know the story, it’s a great one. Meg met Dave Chun and over many years the amazing company called KIALOA evolved. Sure, they share a great line of paddles with the world, but more than that, they share a spirit of ohana. They live and breathe technology and tradition together on the water. It is so much more than an accurate marketing message, it is real and we bump in to it on every island we visit. One example: Check out this link. Each morning we drove our car 4 miles down Kaanapali Beach and parked it. We walked back to our hotel along the cool walkway at 6 am. The plan was to put our boards in the water and do a sweet down-winder back to our car (with a few surf sessions along the way). One morning we met Barry as he was prepping some paddlers for an outing in his outrigger canoe. 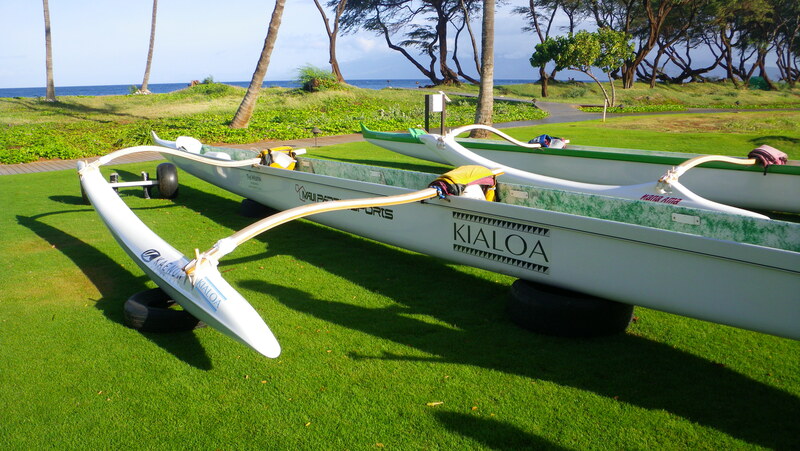 What caught our eye was the “KIALOA” logo on the side and a quiver of brand new Kialoa wood outrigger canoe paddles. It was obvious that Barry was providing a top-of-the-line experience. We chatted with Barry for a spell and learned of his personal paddling aspirations. Like many other pros we have encountered, Barry was especially grateful for the support and sponsorship of Meg and Dave Chun at KIALOA. We stood on the lawn as the early morning light brightened the skies and illuminated Lanai out to our right. Like many of the paddling athletes we’ve met in the past, Barry could “talk story” about the spirit of Kialoa endlessly. He had so many tales to share, and experiences to remember. It was cool to see so much enthusiasm for taking the casual “tourist” out on a traditional outrigger experience. For Barry, the few hours he had with each guest was simply a chance to instill an appreciation of the sea, of the Maui traditions and of the paddling culture. An hour later when we were deep in to our down-winder we saw Barry and his paddlers working their way upwind on what would sure to be a treasured memory of Maui. Even in the hands of first time outrigger paddlers it was great to see that Barry provided the best. 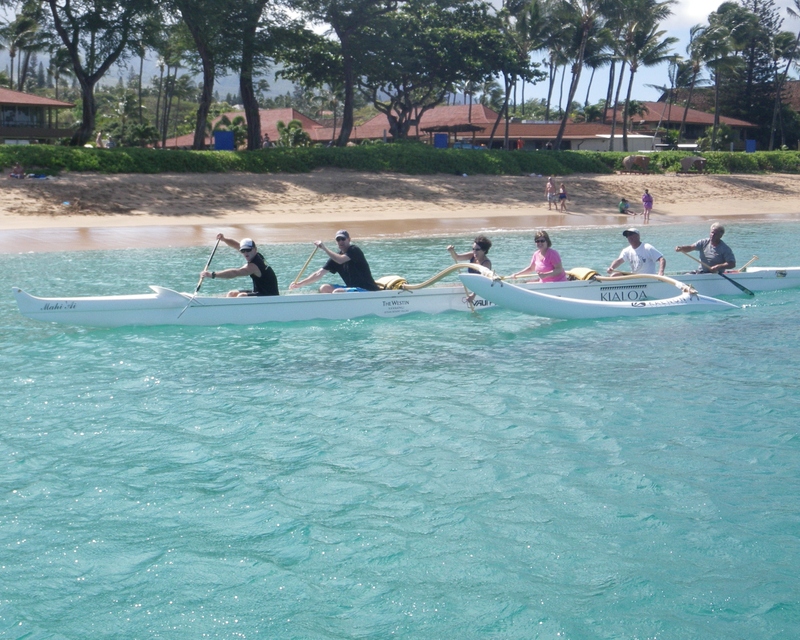 Each member of the day’s outrigger “team” was using a quality KIALOA paddle made of fine woods and exquisitely finished. The feel, the balance and the beauty all added to the experience for the all. It is his way, it is the way Kialoa inspires. This entry was posted in Hawaii, People and tagged elder sup, Kialoa, Maui, Maui outrigger, outrigger by Water Words. Bookmark the permalink.